Youth gangs are not a new phenomenon in East Harlem. New York’s role as the immigrant gateway to America during the industrial revolution of the late 19th and early 20th centuries made the neighborhood a fertile ground for organized groups based on ethnic affiliations. However, over the last 40 years, the community as well as the nature, organization and impact of neighborhood youth gangs have undergone considerable changes. In the last three years, youth gang activity, youth gun violence and youth crime have been increasing in East Harlem, even as overall city crime rates have declined. Community members, law enforcement, schools and service providers all report grave concerns about growing numbers of youth gangs, increased levels of youth violence, and the lack of comprehensive, collaborative approaches to prevention, intervention and suppression. “…you know a problem exists when children 12 years old are involved in shootings.” - New York City Police Officer In 2010, the Harlem Community Justice Center convened the Juvenile Gang Task Force to identify ways to reduce juvenile gang violence and involvement in East Harlem. For the purposes of the Task Force’s work, a juvenile gang was defined as: three or more youth between the ages of 11 and 21 that identify themselves by a common name, set of symbols and rules, as well as locations, and who engage in regular delinquent and criminal activity. 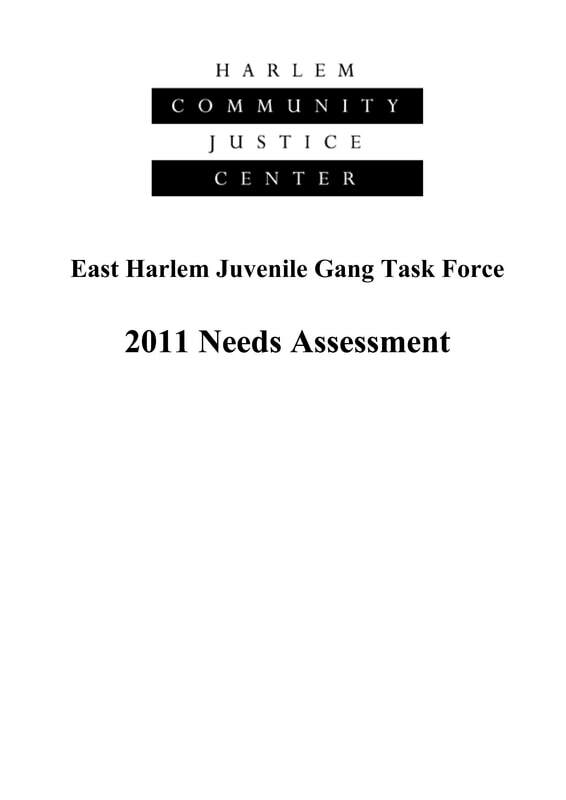 This needs assessment and companion strategic plan are designed to provide a fuller understanding of the extent of juvenile gang activity in East Harlem, provide detailed accounts and perspectives from area youth, parents, service providers and police, and offer a blueprint to reduce juvenile gang involvement and youth violence going forward. Urban street-gang involvement in drug trafficking and violent crime is be- coming increasingly widespread—not just in large cities, but in suburban areas and small towns as well. The Bureau of Justice Assistance (BJA) recognizes that programs aimed at combating gang-related activity must incorporate both crime prevention and crime control initiatives to be effective over long periods of time. 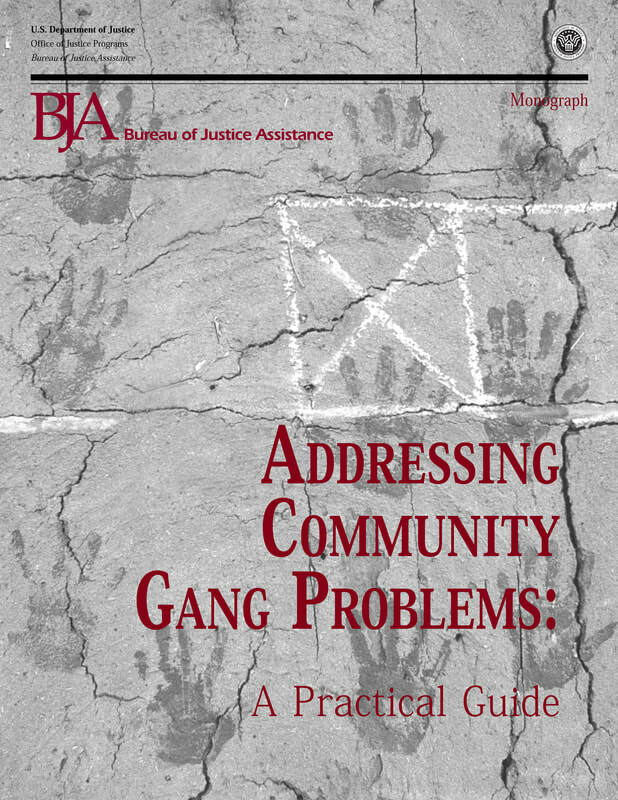 Ac- cordingly, in October 1991, BJA initiated the development of a prototype model of the Comprehensive Gang Initiative. BJA is pleased to present this monograph, Addressing Community Gang Problems: A Practical Guide, as a product of that initiative. It is a useful tool that provides guidelines for agencies and community groups to develop individualized responses to local gang problems. This practical manual provides a foundation for understanding the diverse nature of gangs, the problems they pose and the harm they cause, and the two analytical mod- els for addressing gang-related problems. Two companion monographs complement this one. Addressing Community Gang Problems: A Model for Problem Solving provides a prototype to assist communities in identifying, analyzing, and responding to gang-related problems as well as assessing the effectiveness of their responses. Urban Street Gang Enforcement focuses exclusively on enforcement and prosecu- tion strategies to protect against urban street gangs and presents strategies to enhance the prosecution of gang-related crimes. 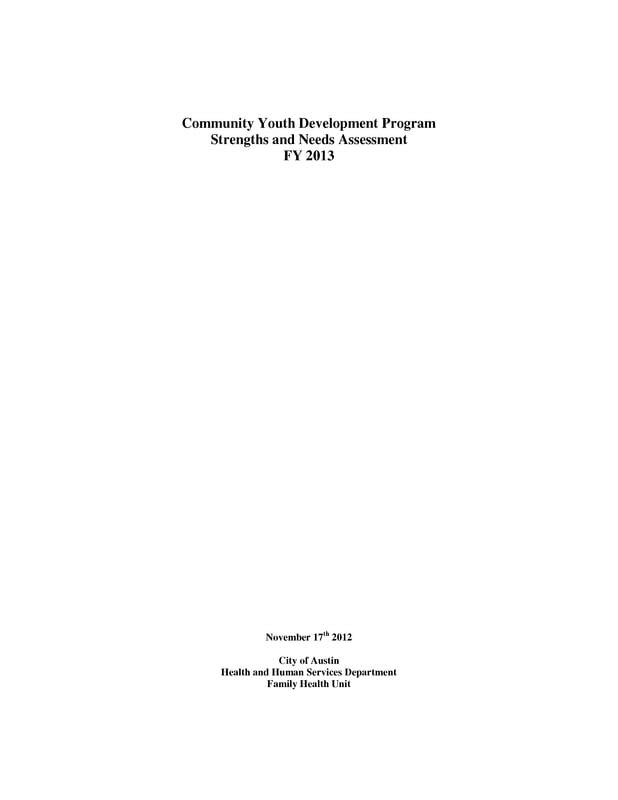 8744 Community Strengths and Needs Assessment, FY 2013(SNA) is an annual report prepared for the Texas Department of Family and Protective Services (TDFPS), Division of Prevention and Early Intervention. The Youth of Promise Initiative is funded through the Community Youth Development (CYD) Grant; a grant awarded by TDFPS to fifteen communities throughout the state of Texas that exhibit high referral rates to the juvenile justice system. The 78744 zip code CYD program is administered by the City of Austin- Health and Human Services Department. This annual SNA profiles the target area and its strengths and needs regarding resources and services available to help resident youth avoid involvement with the juvenile justice system. The report serves as a platform for identifying and procuring ongoing and additional services, as well as improving or expanding current services. The assessment is based on several data sources: • The Community Strengths and Needs Assessment Survey (see Appendix A) reflects adult and youth perceptions of protective factors within the 78744 community as well as gaps in programming that respondents felt would help to reduce juvenile crime. Respondents completed 515 total surveys: 173 Youth surveys and 337 Adult surveys. • Research conducted by a variety of organizations working in the 78744 area. • Community Strengths and Needs Assessment (SNA) Surveys and SNA Reports from previous years. • Interviews conducted with CCC members and CYD service providers. • Focus group conducted with Y AC members. • Statistical evidence of juvenile criminal behavior within the 78744 community. The report presents details indicating that, among other findings: • Between FY 2006 and FY 2013, juvenile referral rates in the target zip code have decreased each year except FY 2010, dropping a total of 33.0%. • Juvenile arrest rates vary each year, but the average arrest rate between 2008 and 2012 is lower than previous years. • Burglary of a residence and Theft are the crimes most frequently committed by juveniles in the 78744 zip code. • CYD programs are providing important services that address risk factors though CYD grant constraints limit the ability to fund programs that would have a noticeable effect on target CYD Internal Assets. • The 78744 community faces unique structural challenges such as lower-than- average incomes, larger household sizes, a high percentage of foreign-born and non-English speaking immigrants, and a small number of community organizations filling a leadership capacity. To assist the efforts of the Commonwealth’s Gang and Violent Crime Executive Committee, DCJS conducted a needs assess- ment survey to identify gang training needs and determine the types of groups that most need training throughout Virginia’s public safety community. Participants included law enforcement agencies with gang investigators, heads of gang task forces from the seven Virginia State Police (VSP) divisions, state agencies with law enforcement capacities, directors of Virginia crim- inal justice academies, and members of the GRIP advisory committee. Of the 93 persons contacted, 66 provided a completed survey response, resulting in a 71% response rate to the survey. 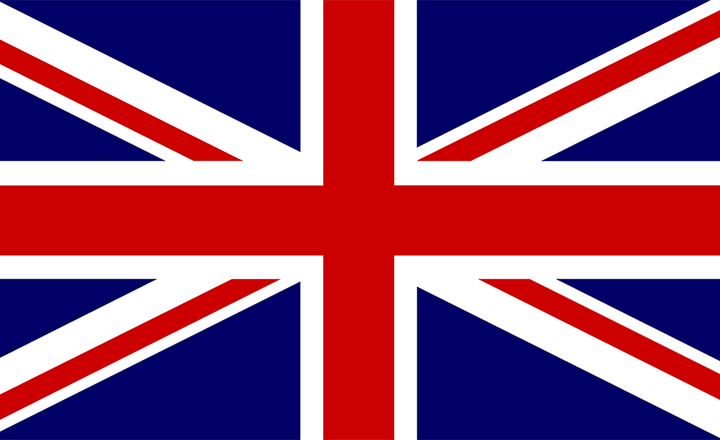 Street gangs and associated serious violence have been a growing concern in the UK over the past decade. They are concentrated in poor, urban areas with high crime rates and multiple social problems. 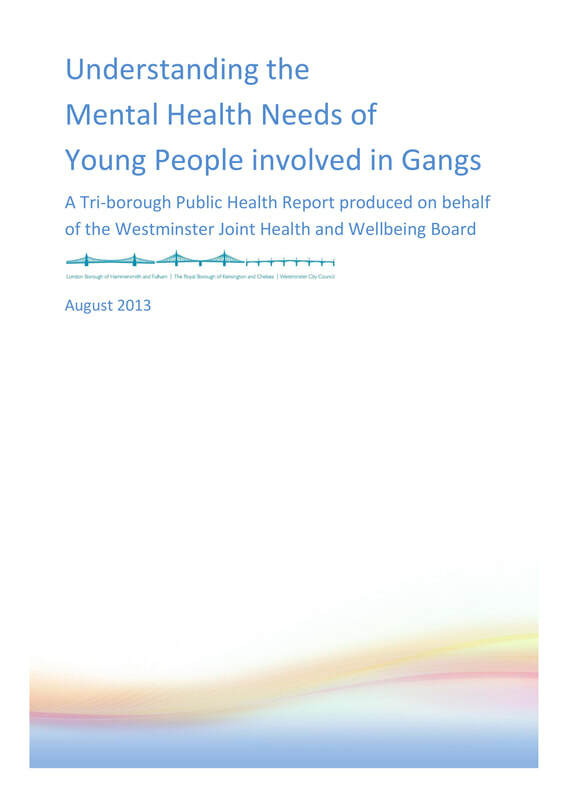 The mental health needs of young people involved in gangs have until recently been overlooked. This report is an attempt to address this situation, and to provide recommendations for local commissioners.